Ottawa, April 4, 2017 —The Canadian Senate must take action to ensure the credibility and effectiveness of national security oversight in Canada, says the International Civil Liberties Monitoring Group (ICLMG), a coalition of more than 40 Canadian organizations dedicated to defending civil liberties from the impact of national security and anti-terrorism laws. 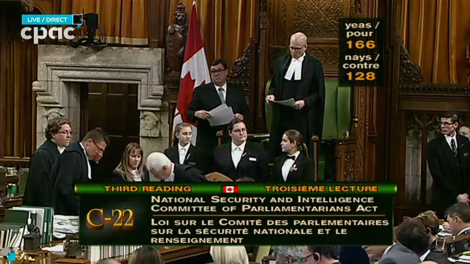 The ICLMG’s statement came as the House of Commons voted at third reading in favour of Bill C-22, sending it to the Senate. Bill C-22 aims to create a Committee of Parliamentarians to oversee national security and intelligence laws and activities in Canada, and was introduced in June 2016 by Liberal House Leader Bardish Chagger. Allow the committee to seek judicial review of government decisions that would restrict the committee’s access to information, deny their ability to carry out specific investigations, or block sections of committee reports from being made public. Most of these recommendations had already been proposed as amendments by the House of Commons Standing Committee on Public Safety and National Defense (SECU), after wide-ranging consultation with leading national security experts, government officials, and civil society groups. However, the government moved to remove these amendments, seriously compromising the bill. “We urge the Senate, in their review of Bill C-22, to follow up on the SECU committee’s important work, and recognize the broad range of support for these recommendations to improve this piece of legislation,” adds McSorley. Beyond these issues, the coalition is also encouraging the Senate to examine the impact of the Committee of Parliamentarians being responsible to the Prime Minister – rather than to the Parliament – allowing him or her to appoint the committee members, name the chair, and vet all reports. The coalition, along with others, has expressed concern that this will limit the independence and appearance of independence of the committee going forward. The ICLMG is also encouraging the public to contact senators to urge them to take action. “National security laws and agencies have real world impacts on the public, from surveillance and invasion of privacy, to delays and detention at borders, to limits on political activism and free expression,” said McSorley. “The public deserves effective, independent and transparent oversight over Canadian national security. It is not too late to achieve that goal, and together we can help achieve that goal.” To that end, the coalition has set up a take action page at www.iclmg.ca where people can access a tool to message the Senate Committee on National Security and Defense. Finally, the ICLMG would also like to reiterate that Canada must also implement an expert, independent national security review body that would complement the Committee of Parliamentarians. Such a body was recommended by, among others, Justice Dennis O’Connor, at the end of the Arar Inquiry. “The formation of the Committee of Parliamentarians cannot signal the end of our work to establish strong and effective oversight and review of our national security agencies and policies,” said McSorley. This entry was posted in News from ICLMG on 4 April 2017 by ICLMG CSILC.